The Sharp Shooter’s custom earplugs are designed for protection against water and noise. They can be used in a number of industrial and recreational applications such as shooting, swimming, motorcycling, sleeping, industrial work, etc. They offer the best in comfort and durability and have become well recognized throughout the world. Made on-the-spot at The Sharpshooter, Insta-Mold’s provide the best in proven protection against extreme noise and water activities. With several color choices to choose from and the benefits of Insta-Mold’s Insta-Seal Plus seal koter, you will love these earplugs for several years of use! Only $45 per pair. Insta-Mold silicone earplugs are customized to fit your ear with greater comfort, maximum attenuation value and greater convenience. When made correctly, they provide a reliable “tissue-to-tissue” fit duplicating every crevice and contour of the ear, which allows the user to wear these earplugs for extended periods of time without discomfort, irritation or constant removal from the ear for re-insertion. 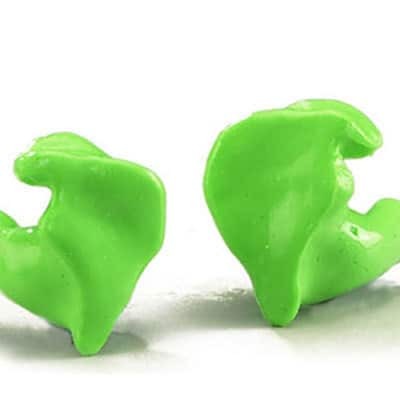 Made from a medical grade, hypo-allergenic silicone, Insta-Mold earplugs offer the ultimate in comfort because they are custom shaped to each individual’s ears. This eliminates the amount of discomfort usually faced with the common expanding foam earplugs, and the constant hassles of bulky earmuffs. Insta-Mold’s also remain flexible and soft throughout their lifetime giving you several years of consistent use. By obtaining this ultimate fit, Insta-Mold’s achieve the best attainable NRR rating, and provide the maximum in hearing protection for the individual user. Below is the actual noise attenuation chart performed by one of the most reputable testing facilities in the world. It accurately displays the amount of protection you will receive from a properly fit set of Insta-Mold’s through the common frequency spectrum. How Much Protection Can One Expect From a Well-Fit Pair of Insta-Mold Ear Protectors? Look at the chart below to see the results for yourself! All tests were conducted in accordance with ANSI (1974 and 1984) and EPA – 1979 Standards.